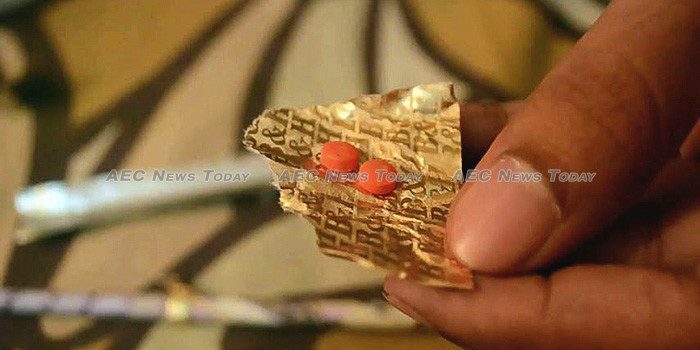 Senior counter-narcotics officials from around the world met in the Myanmar capital Nay Pyi Daw last week to thrash out policies aimed at stemming the flood of synthetic drugs throughout the region. Hosted by the Myanmar government, with support from the United Nations Office on Drugs and Crime (UNODC), the seminar sought to address the Asean synthetic drug flood by tackling it at the source: the pre-cursor chemicals and pharmaceuticals needed to manufacture the finished products. According to UNODC regional representative Jeremy Douglas the production of methamphetamine in the region, particularly from Shan State in Myanmar, is “like nothing we have ever seen before”. Describing the amount of methamphetamine and other synthetic dugs coming out of Myanmar as worth billions of dollars annually, Mr Douglas noted that despite an increase in the amount of precursor chemicals needed for production, reported seizures of these chemicals and pharmaceuticals were few and far between. Acknowledging Myanmar’s role in the flood of synthetic drugs flooding the region, Myanmar vice minister of Home Affairs, Major General Aung Thu noted “While we are a significant source of illicit drugs, we are not a source of the chemicals”. Without detailing figures, UNODC said seizures of synthetic drugs so far in 2018 had “exceeded the record numbers seized last year”. The supply was so great, it said, that in Thailand the price of one ‘ya ba’ (literally “mad drug”) tablet was as little as $1-$5 (about Bt33-Bt166), compared with up to five times more in 2014. Similarly, the price of crystal methamphetamine (commonly called ice) has also dropped across region, with both forms of the drug more affordable and accessible. Easily transported, and with a seemingly never-ending supply of customers, reports in the Thai media of couriers apprehended with telephone number-long quantities of ya ba, methamphetamine, and ice are an almost daily occurrence. While quantities in the hundreds of thousands are common, quantities of five or ten million ya ba pills and hundreds of kilograms (1kg = 2.2lbs) of heroin or ice are not infrequent. 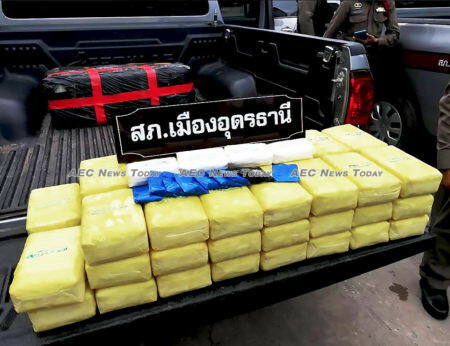 Earlier this year one shipment of 11.996 million speed pills weighing 1,425 kilograms (3,141lbs) was seized in the northern province of Chiang Rai near the Myanmar border. In addition to being on the receiving end of the methamphetamine products, UNODC said countries such as the USA and Australia were also major destinations for powerful synthetic opioids such as fentanyl, which were being mixed with opiates and heroin to maximise profits. After almost two years of preparations, during which the topic has been raised at numerous regional forums, National Narcotics Control Commission of China deputy secretary general Min Tianshi said “There is growing momentum to address cross-border precursor diversion and trafficking”. While a new Safe Mekong strategy aimed at tackling pre-cursor chemicals will be introduced at the Mekong MOU Ministerial Meeting in Thailand next year, there are concerns governments in the region may not be acting fast enough. UNODC Synthetic Drug Analyst Inshik Sim said “the synthetic drug situation is changing quickly, and yet the speed information is being developed and exchanged is not keeping pace”. Pointing to UNODCs SMART early warning system, Mr Sim said governments should use it to look for and identify new substances and chemicals, and share that information with one another. The Smart early warning system, he said, received updated data from law enforcement operations and seizures, but also often from regulatory and health authorities who saw things before the police. Last month the Thailand government announced a three month ‘war on drugs’ in response to the flood of synthetic drugs entering the kingdom. Deputy prime minister General Prawit Wongsuwan said the country was a major transit point for overseas shipments of synthetic drugs. He did not address the topic of Thailand as a destination point. In the 12 months from October 2017 to September this year, some 350 million ya ba pills, 18.5 tons of ice, 900 kilograms of heroin, and 32 tons of marijuana had been seized, he said. Acknowledging that the drug problem in Thailand was “not yet under control”, Niyom Termsrisuk, secretary-general of Thailand’s Office of the Narcotics Control Board (ONCB), said the looming five-year Safe Mekong initiative action plan, due to be implemented next year, would hopefully change that. At a forum in Chiang Mai last week Mr Termsrisuk said there were currently some 300,000 Thai people in need of drug rehabilitation services, of whom 80 per cent, or some 240,000, were under the age of 24. Sreypov Men in Phnom Penh contributed to this story.